October 26, 2013: SPIEL Rocks! 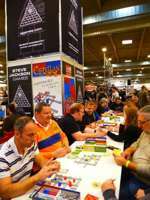 We are at SPIEL in Essen and our booth in hall 2-C118 is packed all the time! 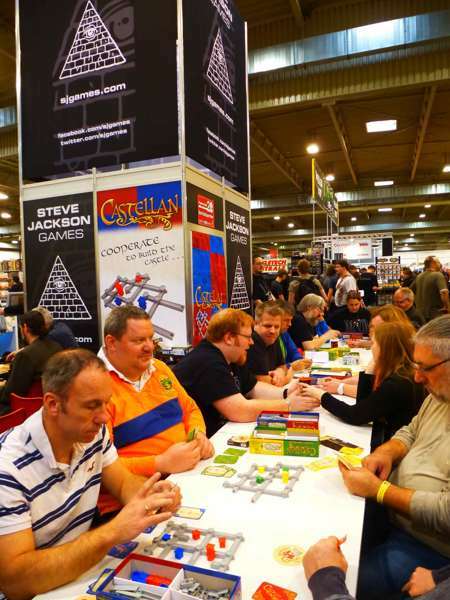 Castellan is getting VERY positive feedback from all kinds of gamers, as is our other brand new release Chupacabra. The nice folks from our retail partner Tellurian are very happy with sales, and they doubt that they will have any copies of the abovementioned games left when the show ends on Sunday. If you are at SPIEL, you will most likely have us on your radar already, but if you can't be there, watch our Flickr account for pictures. We've already got a handful up, and there'll be more after the show!